Pro-Tect UV Systems feature durable, non-corrosive schedule 80 PVC reaction chambers. The schedule 80 PVC is more robust when compared to HDPE or polypropylene models and offers significant cost reduction when compared to 316 Stainless Steel. Pro-Tect UV systems are rated for operating pressures of up to 150 PSI*. The "L" shaped design used allows for proper hydraulic mixing inside the UV reacation chamber and optimizes the UV dose. 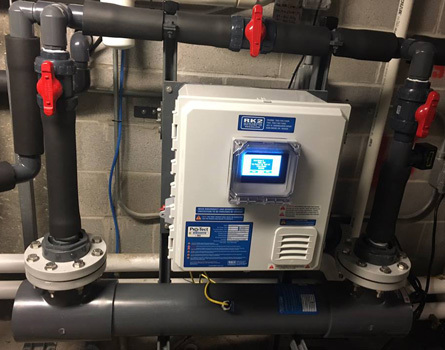 Pro-Tect UV systems utilize a single end lamp and quartz sleeve access that simplify maintenance and reduce over all cost associated with operating a UV system. Changing lamps and sleeves has never been easier. A quick "no tool needed" design allows for easy removal of lamp cables with without the risk of twisting cables and causing damage. A special fitting allows the lamp cable to remain in place while the lamp nut is spun. A simple o-ring seal allows for easy changing of sleeves without the risk of breaking by removing thick walled rubber gaskets that tend to become brittle and stick to the sleeve. With Pro-Tect UV systems you’ll no longer need to worry about proper lamp placement. 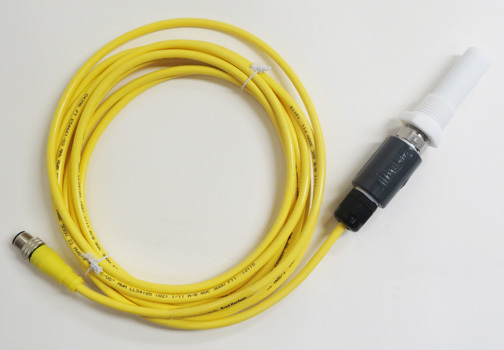 The distance from the cable crimp to the lamp connector are pre-set at the factory, allowing for proper placement of the lamp everytime. All Pro-Tect UV systems feature an over temperature safety cutoff. 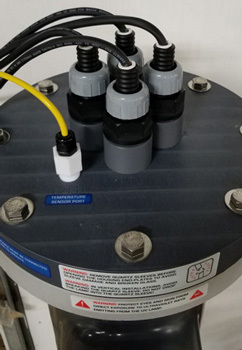 What makes Pro-Tects' temperature sensor different is that unlike other models with sensors in the main portion of the body or vessel, our sensor is located in the lamp bulkhead or endplate. Locating the sensor in the endplate protects critical sealing components from overheating and failing due to the close proximity of the lamp filament (hottest part of the system). 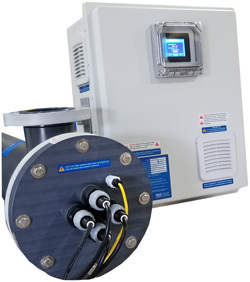 Pro-Tect UV HMI Controllers are manufactured using noncorrosive thermoplastic or fiberglass enclosures. 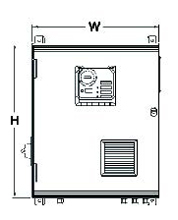 Our HMI contollers have a NEMA Type 12 rating and are 508A UL listed. 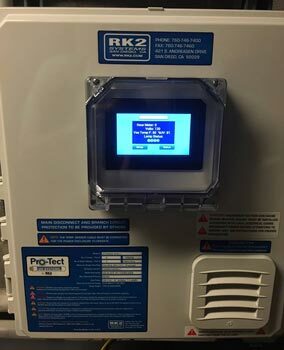 Pro-Tect’s HMI control packages are user friendly and feature a color touch screen display showing basic operating status of the UV system and alerts users to any problems related to the UV system. Both the standard HMI and Pro Series packages include the over tempature safeycutoff as standard options. Upgrading to the optional HMI Pro series control package expands the capabilities of your Pro-Tect UV system. The HMI Pro series offers a larger color touch screen display and more advanced monitoring and control options. Corrosion Proof Schedule80 PVC-stronger and can handle higher pressures when compared to HDPE and polypropylene reactors. Single end lamp and sleeve access makes for easy maintenance. Correct, repeatable lamp placement 100% of the time. Standard over temperature safety cutoff switch-turns the lamps off when water reaches 120F, preventing damage from overheating. Temperature sensor location-located in lamp endplate, the hottest part of uv reaction chamber. American made Low Pressure Amalgam (ALH) and High Output (HLH) UV lamps. These lamps are designed for 12,000 hours of continuoususe and are 80% efficient after 12,000 hours. Electric Ballasts are matched to the performance of the required lamp for optimal UV-C output and longest useful lamp life.